What if you have two devices, out of which only one have access to Internet but you want to use it in other device also. For example, when you're travelling in a train and want instant access to Internet on your Laptop or iPad. This can be done with tethering feature. Before moving further, let me ask you one simple question. What do you think about tethering? In short words, tethering is a way to share your phone's 2G/3G Internet connection with other wireless devices. 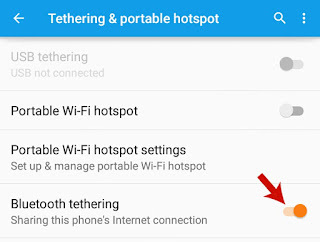 Android also have tethering feature using which you can share its Internet connection with any other device. Basically, there are 3 tethering modes available which are named as Hotspot, USB and Bluetooth tethering. 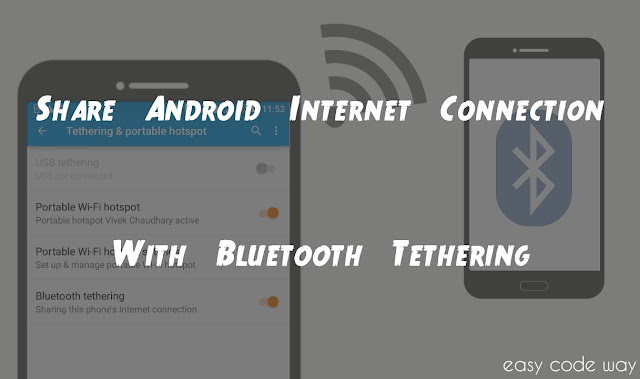 In my previous article, I had already discussed on hotspot tethering using which you can create Wi-Fi zone anywhere and now in today's tutorial, I will guide you how to use Bluetooth tethering feature. So let's start from basics. First of all, turn on the Bluetooth on both devices and pair them. Now in device A, go to "Settings > More > Tethering & portable hotspot" location. Here you'll find "Bluetooth tethering" option. Simply turn it on by moving the button next to it. Now hold your device B and open its Bluetooth option from settings. Here find the name of your device A (which was already paired) and click on settings icon next to it. A pop up box will appear. Finally tick mark the "Use for Internet access" button and hit OK to save it. Assuming that your device A has some Internet connection, you can use it in your device B also. If you're unable to access it then make sure to turn on mobile data on A. Sometimes you may face error while connecting both devices. If you're facing this same problem then consider these thing. Make sure that you've paired both devices correctly. You should keep in mind that you've to click on "Use for Internet access" button from your device B only, not from A. This is the most common problem. Check whether your device A can access Internet or not. If not, then contact your service provider or else try adding APN Internet settings manually. Last but not least, try to update your Android phone with latest version. Additional Tip: Obviously, while using tethering feature, your both phone will continuously transmit and receive signals and due to this, your phone's battery may drain faster than normal. So keep this thing in mind whenever you're in remote areas. I had already posted few simple tips which can improve your Android phone battery life. There is another amazing use of this Bluetooth tethering feature. You can use it to steal your nasty cousin's Internet data. This is what I usually do behind their absence. Finally if you've any questions, fell free to drop them in below comment box. Love and blessings! 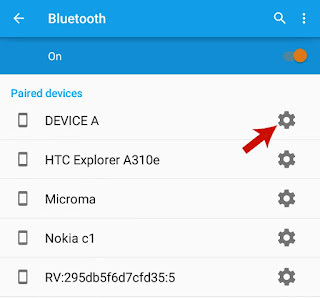 Bluetooth pairing confirmation stopped working from Andorid 6.0 version. Is there alternate way to achieve this?